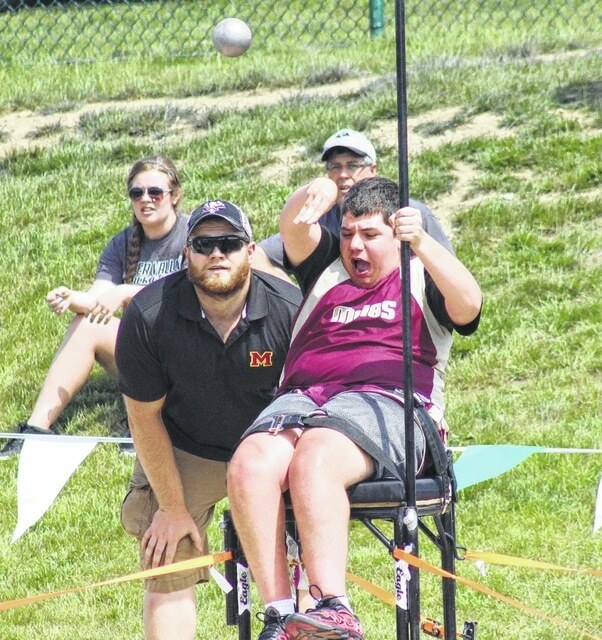 Meigs junior Cory Scarberry competes in the wheelchair shot put, while Marauders assistant coach Tyler Brothers looks on at the 2015 OHSAA State Track and Field Championships at Jesse Owens Memorial Stadium. COLUMBUS, Ohio — The 2015 OHSAA State Track and Field Championships are under way at the Jesse Owens Memorial Stadium on the campus of The Ohio State University. Meigs, River Valley, Gallia Academy, Eastern and Southern all had participants in the opening day of competition, with the Marauders getting on the board first. Meigs’ lone participant, junior Cory Scarberry, claimed fifth in the wheelchair shot put with a throw of 7 feet, 2.5 inches. Scarberry’s fifth place mark ties Mason Metts for the best finish at the OHSAA state meet in MHS history. Metts was fifth in the 2009 boys’ shot put. The Blue Angels were represented by sophomore Madi Oiler, who posted the eighth best preliminary time in the 300m hurdles (46.31), and qualified for Saturday’s final. Eastern was led by the girls’ 4x800m relay team of Laura Pullins, Asia Michael, Taylor Parker and Jessica Cook, which finished 13th with a time of 10:05.33. Pullins, a sophomore, finished 16th in the 400m dash with a time of 1:02.36, while classmate Alia Hayes fouled on all three attempts in the girls discus throw. River Valley’s boys 4x400m relay team of Ethan Hersman, Mark Wray, John Qualls and Andrew Moffett was 13th with a time of 3:30.46. Southern’s lone state qualifier, sophomore Jaylen Blanks, was 16th in the 200m dash with a time of 23.60. Five athletes, three from GAHS and two from EHS, will be competing in finals on Saturday.